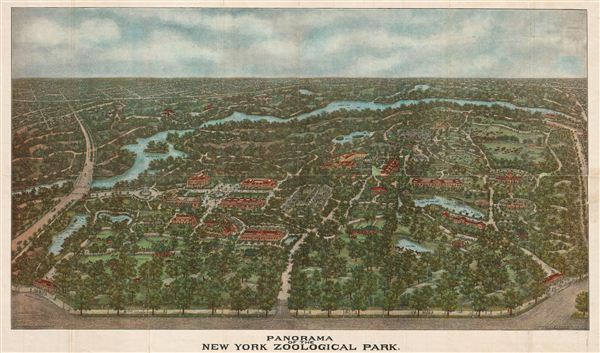 Panorama of the New York Zoological Park. A panorama or bird's-eye view of the Park in perspective was issued and put on sale in June of this year. This view, which is 15x27 inches, was made in four colors, from an original drawing which required several months in preparation. The price at which it was offered (twenty-five cents) will probably be reduced next season, as the demand has not been up to our expectations. Very good. Original folds exhibits some verso repair and reinforcement. Closed repair extending form right margin approximately 3 inches into the view.